In 2015 we published the Savor the Islands Passport, and fun guide to farms and local food in the Islands. Passports with maps and descriptions of local farm and food businesses were distributed across the region for locals and visitors alike to pick up and use. For each participating business that they visit, they can get a unique stamp, and anyone submitting a full passport will be entered into a drawing for one of three great prizes in October 2016. We are excited to help bring new and returning customers to our farms, to learn about local agriculture and taste delicious local foods! In 2015 we took our Savor the Islands Dinners to a new level by partnering with the Healthy Roots Collaborative and Grand Isle and Franklin County non-profits, economic development organizations, farmers, brewers, vintners, and chefs to host "In Good Taste: Savor the Islands," a local food tasting extravaganza at Knight Point State Park in North Hero. 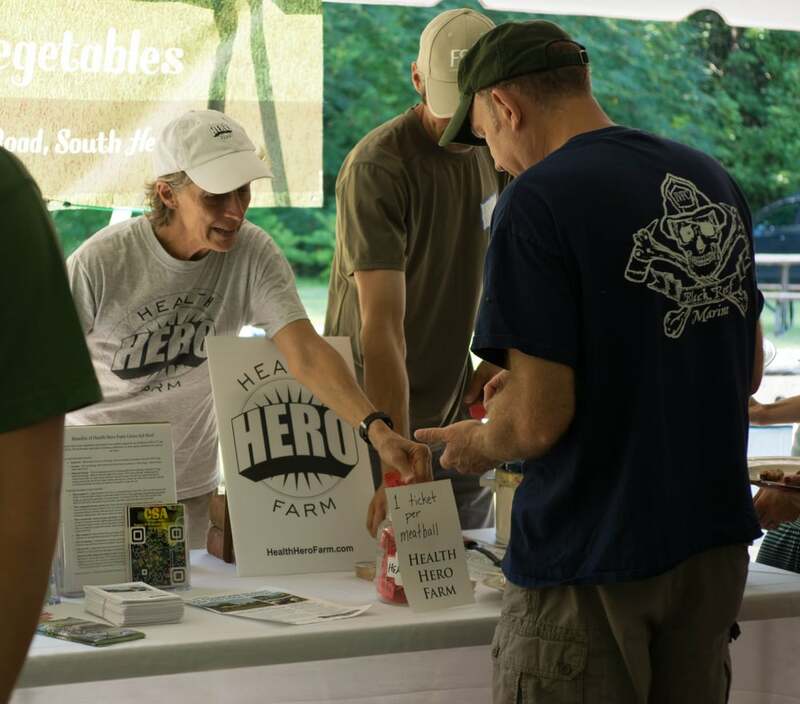 Farm and food businesses from Northwest Vermont set up booths and gave out delicious samples- from meatballs and pulled pork to ice cider, goat milk caramels, and pickles. It was a beautiful afternoon at the park, and fun for all. Over the past two years we have hosted 9 farm dinners and local foods tastings at Champlain Islands Farms. These dinners bring the community and visitors onto the farm for a fun local meal featuring ingredients from our members' farms- from meats, eggs, vegetables, maple syrup... and some of the great specialty foods that chefs and bakers create with local ingredients- pasta, butter, jams, pickles, ice cream, and sweet treats. Farm tours, love music, great company, and beautiful settings come together to create an an-farm experience to remember! Jane and and Ben Pomykala pose with a sign listing all of the amazing partners who provided local ingredients for our farm dinner at their home farm. We are partnering with the Grand Isle County Conservation District to promote composting and water conservation in our county. Through educational materials and demonstration composting and rain barrels throughout the county, we are encouraging the community to think about their impact and role in a sustainable food system- from keeping food out of the waste system and returning valuable nutrients to the soil, to protecting Lake Champlain through water conservation practices. Amanda and Hugo Gervais operate a diversified farm in North Hero, with chickens, pigs, cows, vegetables, flowers, and a small sugar bush.